I am calling this salmon dip because it’s a lot less fancified than “mousse,” and besides, a mousse implies a totally emulsified, fluffy product bound with cream and eggs. This ain’t that. This is a fantastic party appetizer or football-watching food that you can make in about 10 minutes. I got the recipe from one of my favorite Scandinavian cookbooks, Kitchen of Light: The New Scandinavian Cooking, by Andreas Viestad. I did make a few modifications, however — less sour cream, white pepper instead of pink pepper, and I don’ t like mixing the caviar into the dip, I like it on top. But structurally it’s pretty close. If you don’t have or don’t like caviar, no worries. It’s fine all by itself. If you happen to be catching fish and want to make your own caviar, here are my instructions on how to make caviar. Make this ahead of time before your gathering and keep it nice and cold. Serve it in waves so it stays cold. 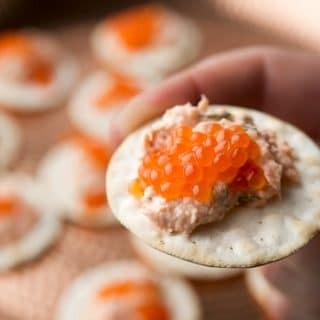 I like to spread the dip on crackers, but you could also use it as a base for a salmon sandwich: Spread some of this on the bread, then top it with slices of smoked salmon. Damn good. 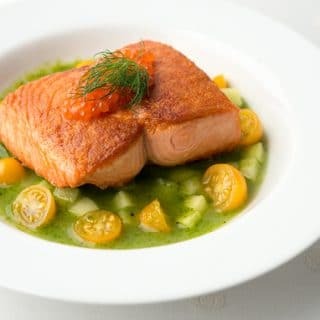 If you are using salmon you’ve caught, be sure to freeze it for a week or so in the coldest part of your freezer before you do this; there is a small, but real, chance of picking up a parasite when you eat raw, never-before-frozen salmon. If you want to do this with trout, same thing applies. 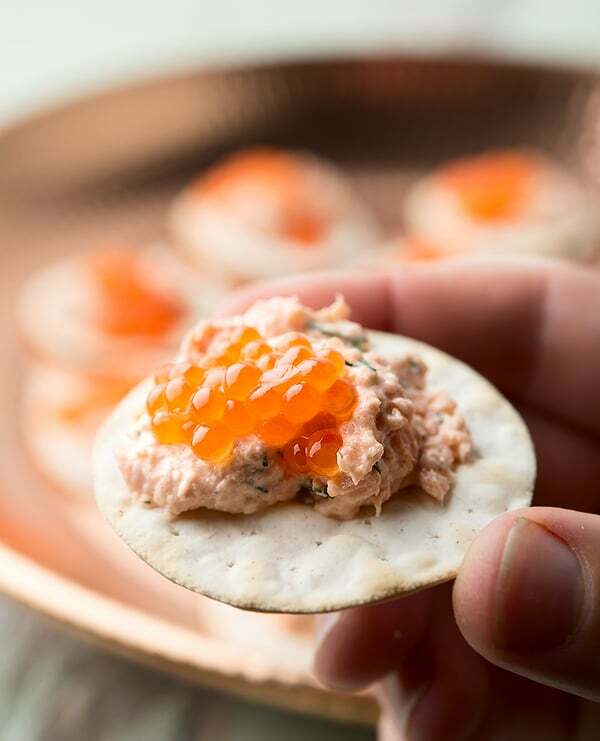 For a spread that uses only cooked salmon, try my Salmon Rillettes. If you live on the East Coast and want something similar, try my recipe for smoked bluefish pate. Keep in mind that this recipe uses raw salmon, so buy sushi grade salmon if you can. If you don't like dill, you can use another herb. Parsley's the ole' standby. For crackers, nothing beats table water crackers, to my mind. They're just a great neutral cracker that lets you enjoy this awesome dip. Remove any pinbones from the salmon. Flake the smoked salmon into smallish pieces and chop the fresh salmon into 1-inch pieces. Buzz both in a food processor a few times until you have a rough puree. Move the salmon to a bowl and mix with the lemon juice, sour cream, dill and pepper. Add salt if it needs it. Serve on crackers with some caviar. Don't make a whole lot more than you think you'll eat in a day or so; this dip doesn't keep for more than 48 hours, even in the fridge. Hank – LOVE the site and books- I gave a bunch out last year for Xmas – huge hit. I catch tons of lakers out of the finger lakes this time of year. The roe is gorgeous but I’m afraid what will happen if I freeze it to rid it of parasites. Any options? It pains me to not take advantage of it. I’d love to make this recipe using those trout. I have never heard of people getting parasites from trout roe. Have you? I do know they get tapeworm from eating raw trout meat, though. They do an excellent whitefish caviar in the Great Lakes that I actually like a lot better than trout caviar. I had good timing catching a egg-bearing salmon a couple of days before a party last year. I made this and it was a huge hit!